The apple orchards in Aomori are completely covered by snow. 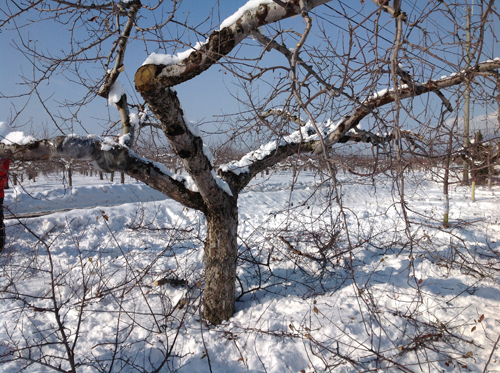 Yet the apple farming starts in winter, deep in the snow. Pruning is the act of trimming branches and leaves to form a proper shape for the tree. The dense branches and leaves will prevent the fruit from growing. It helps the tree to receive enough sunshine, even to the middle of the branches and for the farmers to work more effectively as well. It is so critical that some say that 70% of apple quality is determined by this practice. The farmer I introduce here has regularly shown us his growing procedures. The son has also engaged in farming, so the father and son were working together. They look up at the tree and trim branches while they observe carefully. 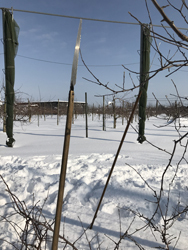 Even for an orchard owner who has long committed himself to apple cultivation, pruning is said to be difficult. The yield of the year, the next year’s outlook, and the condition of the soil and trees are all considered when deciding which branches are to remain. But it is hard to know whether it is right or wrong until it is time to harvest. I found many pruned branches around the tree. It all depends on the size of the tree, but the one I watched took them about 1 hour. 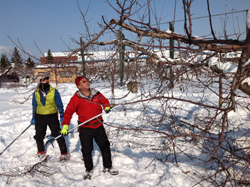 Pruning is said to be the task which needs the most skillful hand. 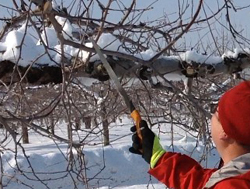 There are pruning lectures held regionally in this season to teach the technique to young producers and experienced growers alike. Since the method of pruning varies depending on the grower or the condition of the soil, there are many people who intend to study at these training sessions. That shows how important it is to prune. 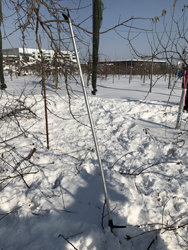 In the severe coldness, the apple farming starts in the snow and looks forward to the harvest season several months later. 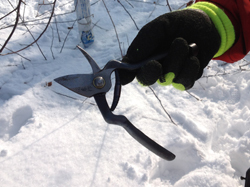 Pruning lasts until the beginning of spring and the other farming tasks follow. I just appreciate the farmers who work in the rain or snow hoping to taste delicious apples in fall. The pruning saw: The long-handle one for higher branches, and the short-handle one. The pruning shears: There are again long and short ones. The shears are used for thin branches.